Pro-FAN-ity by Littlearth offers you the authentic feel of your favorite sweatshirt in their Officially Licensed Hoodie Duffel. 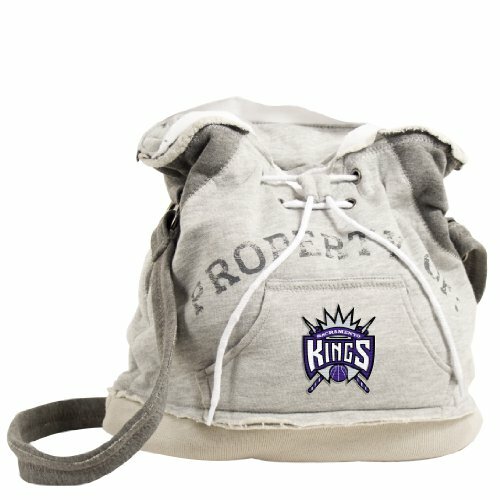 These purses take the authentic look and feel of your favorite team sweatshirt and craft them into purses that will give you that Saturday night style, even when you're heading off to the Sunday afternoon game. Vintage detailing and decorative lacing are just a few of the ways Littlearth offers their Sports Fan alternative ways to show spirit! Our Duffel features both a kangaroo pocket on the front and two internal patch pockets inside. This intentionally frayed Duffel has a sturdy magnetic closure and tied drawstrings used to create a classic look that is sure to become an essential fan favorite for years to come. Contrasting heather gray material on both the bottom and handles of the bag help to keep the Duffel looking clean. Each bag features a distressed "PROPERTY OF" and the Logo of your Team displayed largely on the front. Team Logo is an appliqué with decorative stitching for long lasting and dramatic effect. Classic look of a fan-favorite sweatshirt with the new look of a Hoodie Duffel.